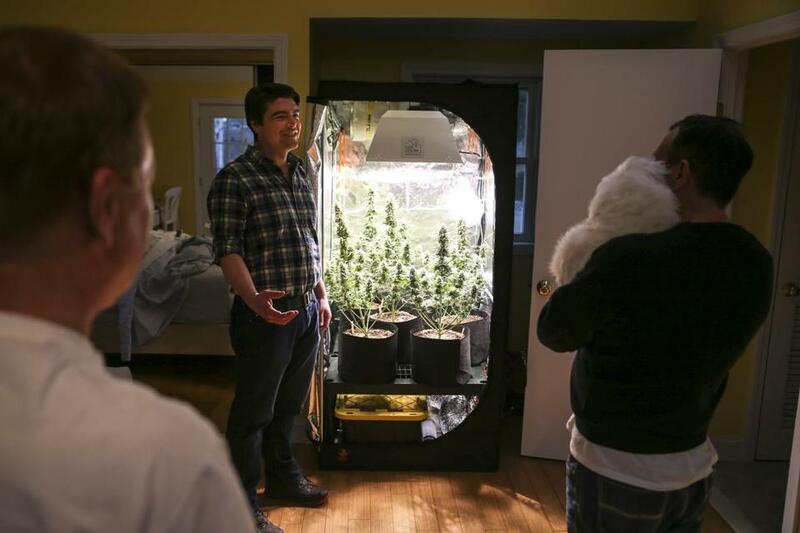 Evan Heenehan of Home Grow Community LLC visited clients at their home in Ipswich to check in on their homegrown cannabis plants. Donna Ceglia turned 50 last November, and she wanted to celebrate in style with her friends and family: music, food, drinks. And a cannabis bar, stocked with jars full of pre-rolled joints. Ceglia watched for weeks as the marijuana was grown in the basement of her Essex home. Now that it was harvested, she wanted to spread the bounty. When Massachusetts voters legalized recreational pot use in 2016, much of the focus was on bringing an end to arresting people for pot possession and laying the foundation for a retail cannabis industry. But the law also allowed residents to cultivate limited amounts of cannabis at home. And now there are entrepreneurs working to meet the demand for customers interested in a more hands-on experience with growing pot. In Ceglia’s case, the cannabis served at her party was cultivated in her home by grower Evan Heenehan, who previously tended the grounds at two Massachusetts golf courses. He took those skills and started his Ipswich-based company, Home Grow Community, to help grow marijuana — a notoriously difficult plant to raise properly — for clients. “I feel like it’s part of my mission to expand people’s consciousness about cannabis and all the different ways it can be used,” Heenehan said. State law caps home growers of recreational cannabis to six plants per person, and a dozen per household. 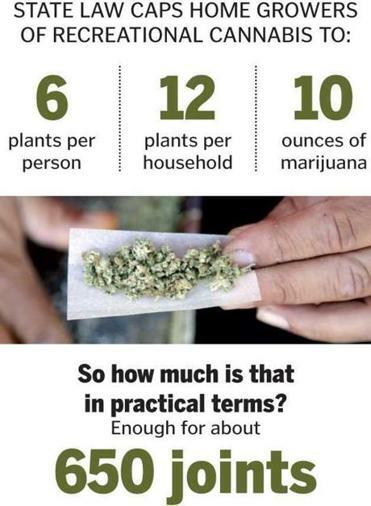 Each household may possess up to 10 ounces of weed. That’s not a small amount of cannabis. A 2014 White House report on drug use estimated a joint contained .43 grams of marijuana; 10 ounces is roughly equal to more than 280 grams, or put another way, the state limit on pot is enough for about 650 joints. Marijuana has to be grown under specific conditions in order to harvest it for consumption, so Heenehan said he provides the equipment, takes care of the plants, and teaches clients how to prepare cannabis after it’s harvested. Heenehan visits a client’s home weekly to maintain the growing cannabis; right now, he focuses on northeastern Essex County. He said he hopes to expand his business into more areas with additional staff, plus addtechnology that would automate remote monitoring and watering of the plants. Heenehan’s contract with clients specifies he will only grow up to state limits, and for each grow cycle, the service costs $1,500 and yields 7 to 10 ounces. “It’s more ‘DIFY’ — we’re doing it for you, and you can be as involved as you want,” Heenehan said. Another of Heenehan’s customers, who asked that his last name not be used, said he is growing marijuana in his own home for medical purposes. “It’s very important to me to know how it’s grown and how pure the material is,” Joe said. The 51-year-old Ipswich resident uses cannabis to help treat pain he experiences as the result of arthritis caused by a car crash in his 20s, he said. Before pot was legalized, Joe said he tried growing his own weed at home, but was unsuccessful. Joe sought out Heenehan through a mutual acquaintance to help him cultivate his own cannabis, he said. “I’m not excited about seeing the finished product — I want to see the whole process,” Joe said. Now Joe’s marijuana plants are growing in an enclosure kept in his bedroom. “You can’t become an expert after just one harvest . . . I’m going to stay with Evan for as long as I can,” Joe said. If you plan to go the DIY route and grow your own pot indoors, according to Bernard, of the grower advocacy council, figure on spending at least a few hundred dollars on equipment such as a purpose-built enclosure to house the plants and lighting. You also may want a filtration system — marijuana has a rather distinctive odor, and the growth cycle lasts several weeks. “If you have self-discipline, and can follow a regimen, it’s not terribly difficult” to grow, Bernard said. So how do those costs compare with buying recreational pot from a retailer? An informal review by the Globe of flower prices at Massachusetts pot retailers in late January show they generally charge around $50 for an eighth of an ounce, and prices reach about $300 to $400 for a full ounce. Bernard said the home growing community helps support professional retailers in the marijuana industry. One change, thanks to legal home growing, has been the chance for professional gardeners to expand their services to include marijuana. Renee Bolivar, owner of Gardens By Renee in Wayland, originally opposed marijuana legalization. But after the 2016 vote, she started fielding inquiries from customers who wanted to know how to grow pot, she said. In the years before legalization, Eli Constantinou, the owner of GYOstuff in Cambridge, said he’d ask customers to leave his garden supply store if they talked about using his stock to raise marijuana. Ceglia, who celebrated her birthday with a cannabis bar, said some of her friends remain surprised at the idea of openly growing pot. She is trying to make them more comfortable with weed — and she thinks growing it in her basement, under the care of a professional, will help.